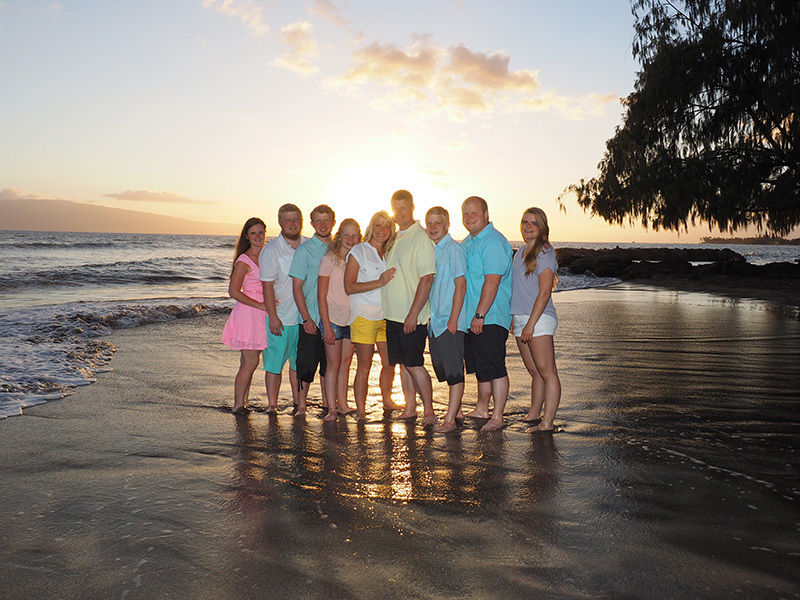 Large family portraits on Maui, often at a lovely beach during sunset, poses some unique challenges for a portrait photographer. Posing so many people in such a way that everybody is seen is not as difficult as making sure everybody’s eyes are open at the time the shutter clicks. There is no way to make sure that is the case at the time. It’s afterwards in the ‘post processing’ phase in which the photographer examines each shot that it can become apparent that somebody in the large family had their eyes closed! The remedy is to take a lot of pictures. In any one setting, with any one family pose, I will take half a dozen shots. In almost every case, there is one shot in which everybody’s eyes are open and looking at the camera. In those rare instances in which no picture contains everybody’s eyes open, Photoshop skills are handy for an eye from one picture can be transported to another picture, and look as though it belongs perfectly. This year’s highlight selection was tough because there were several families this year, each with their own ‘aura’ and ‘atmosphere.’ Each family was back-dropped by a different sunset scene, each one beautiful, eye-catching and memorable.